Herod the Great built this monumental fortress and palace in the Judean desert south of Jerusalem, and was buried here. The site was a rebel stronghold during the great revolts against the Romans. 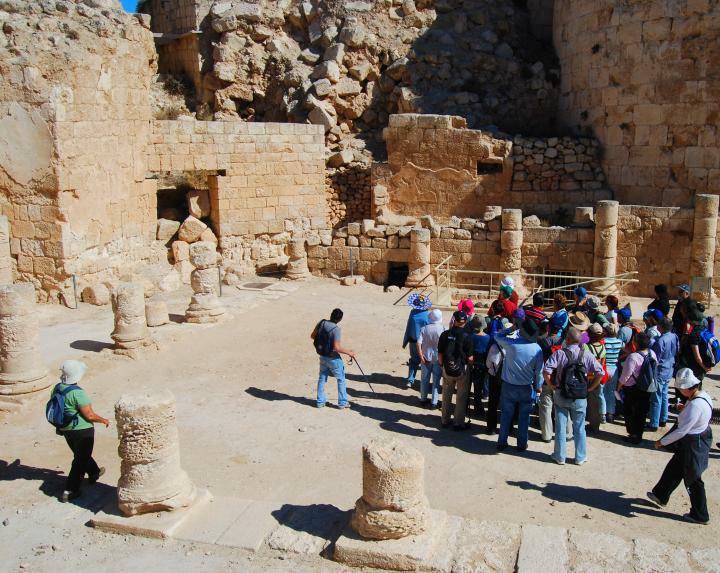 It is one of the most exciting archaeological sites in Israel. Flavius Wars 1 21 10: "... built a fortress upon a mountain towards Arabia, and named it from himself, Herodium"
Herod the Great built this monumental fortress and palace on the highest hill in the Judean desert, 15KM south of Jerusalem. 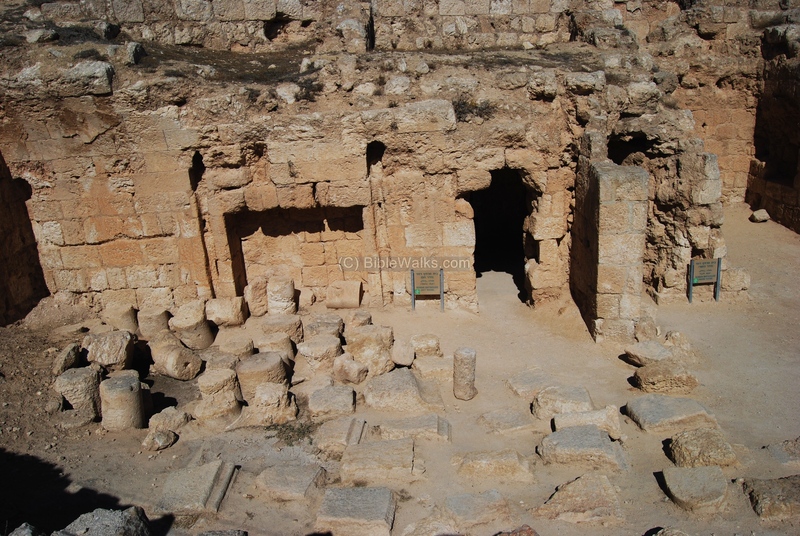 Herod was buried in the site which bore his name. The site was later a rebel stronghold and hiding place during the great revolts against the Romans. It is one of the most fascinating sites in the Holy Land. The site is located 15 KM south of Jerusalem and 5 KM south-east of Bethlehem, near ancient roads that led to the Dead sea. The hill is 759M above sea level - the highest peak in the Judah desert. You can point on the purple points to navigate to the selected point. Herod the Great, King of Judah (37Bc to 4BC) during the Roman period, was one of the greatest builders in the history of the Holy Land. Herodion was one of his monumental construction programs, built in the years 23-20BC in a large complex (50 Dunam - 5 Hectares) that included a fortress on the upper city and a palace and gardens in the lower city. 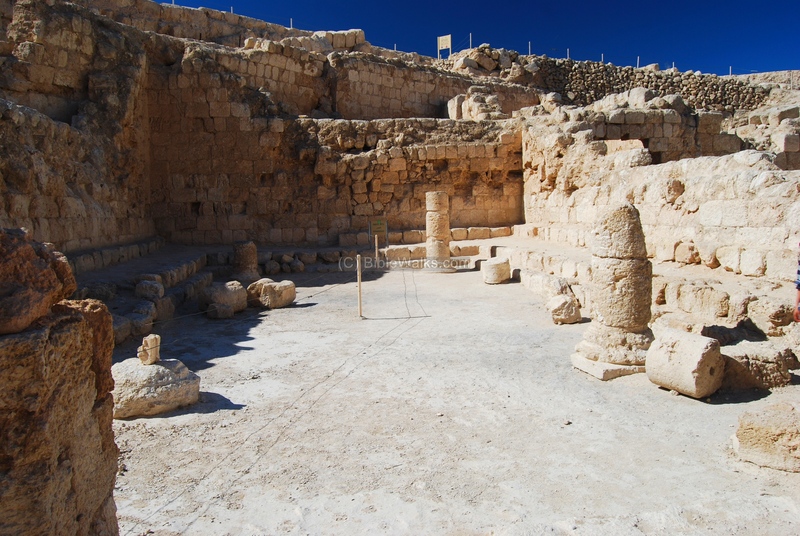 The site was selected due to its high altitude, its location near the desert road, and to commemorate Herod's victory near the site (in 40BC). The fortress was initially built as a 7-story 35M high structure with walls that stood high above the natural hill. Later the external walls, facing the hillsides, were hidden behind a land fill that covered the walls from all sides. The earth was dug out from a nearby hill on the north side. The lower 2 floors are underground and supported by arches, while the upper floors were covered by wooden ceilings. 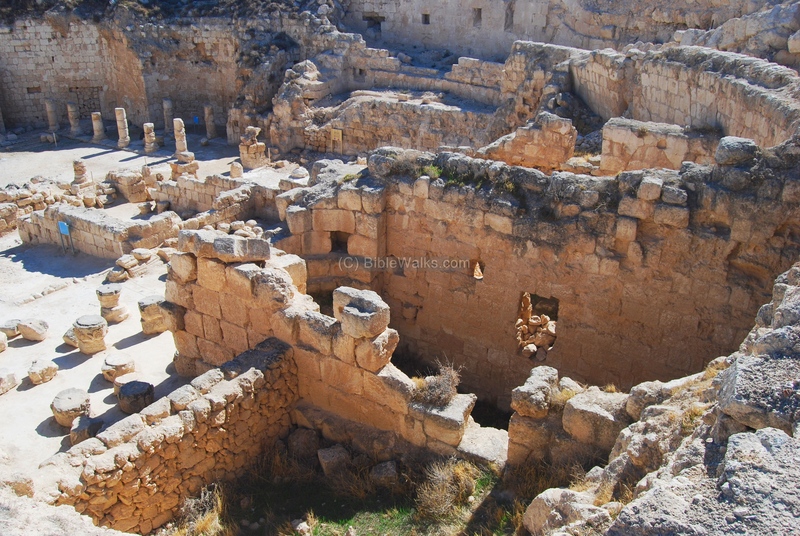 Inside the fortress was Herod's private castle, with courtyards, rooms and bath houses. The fortress was connected to the lower city by a straight stairway which ascended on its north-east side. In the lower city were palace and office structures, a large Roman garden, and lake. The water to the lower city was supplied to the lake by an aqueduct from the area of Bethlehem. The water for the upper city was supplied by cisterns built on the north-east side, and fed from rainfall. 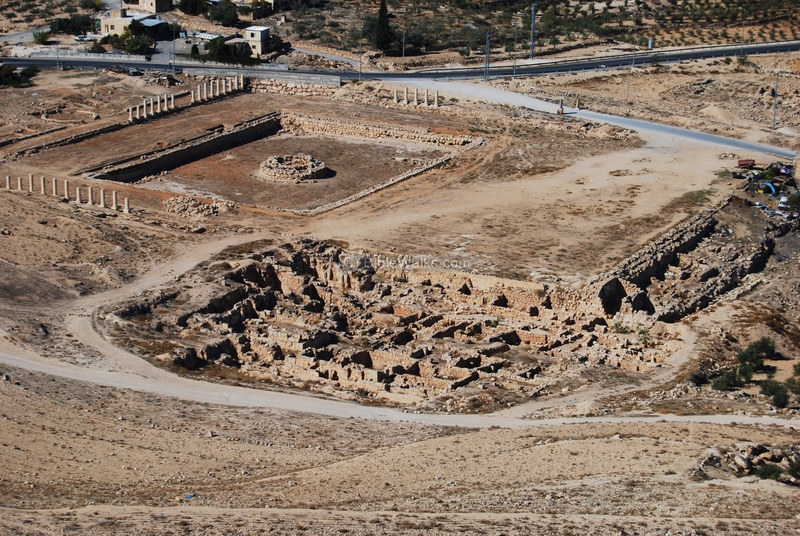 Herod was buried in this site in a royal procession, as described by the historian Josephus Flavius. During the Great revolt, the Zealots captured the fortress in 66AD. They converted a public structure to a synagogue and added two Mikveh (baptismals), one near the structure and the other near the eastern tower. They also built make shift structures which were dismantled during the excavations. After four years under siege, the rebels finally surrendered without bloodshed to the Roman army. During the Bar-Kochva revolt (Bar Kokhba 132-135AD) the fortress was captured again by the freedom fighters. As part of their defense measures, they dug secret tunnels around the cisterns, and hid there. 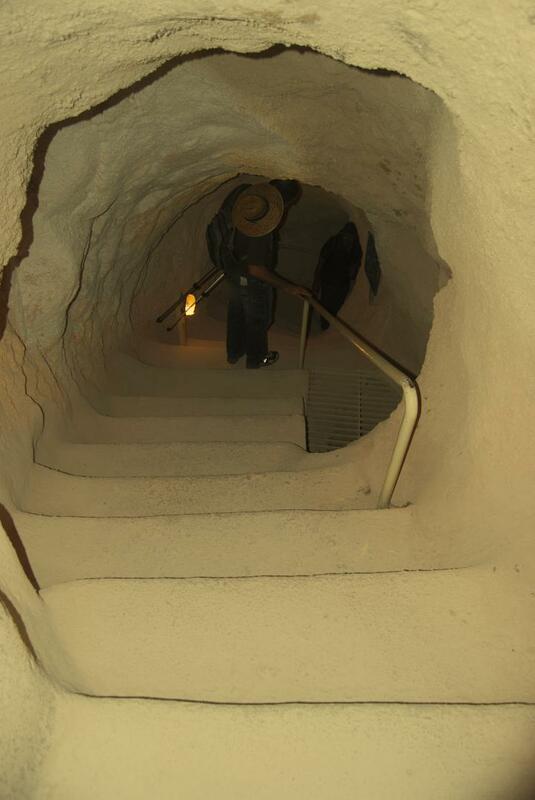 This underground network of escape tunnels is one of the highlights of the excavations. The site was deserted until the 5th century , when a large community of monks resided in the site and constructed 4 churches in the area. After the Arab conquest (7th century ) the site was in ruins, and the area was populated by Bedouins in recent 50 years. The site was examined in the PEF survey (1866-1877) by Wilson, Conder and Kitchener. A section of their survey map is below on the right. Notice the double dashed lines (Roman and ancient roads) that pass near Herodion , named Jebel Fureidis (Arabic for: Paradise). 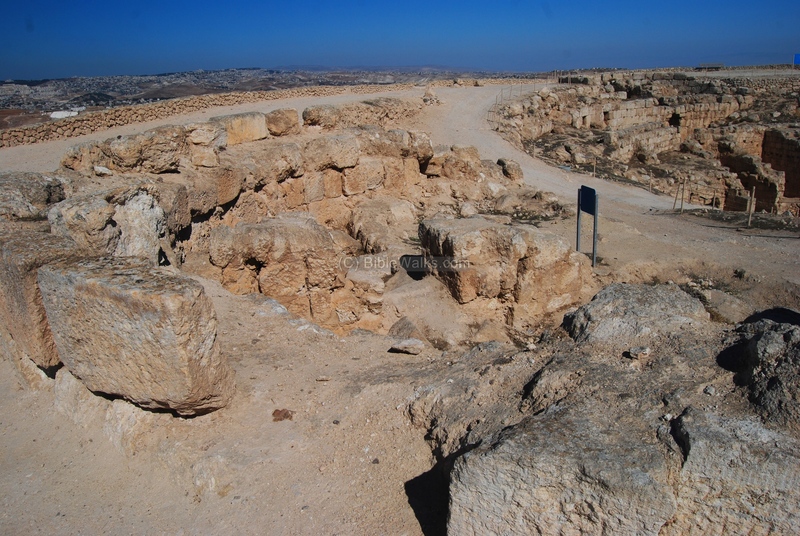 The Herodian aqueduct, that conveyed waters from the Artas springs, appears as a line that follows the road from north west. "Jebel Fureidis - The mountain is a truncated cone 400 feet high, 290 feet diameter at the top, with sides artificially scarped at an angle of about 35°. 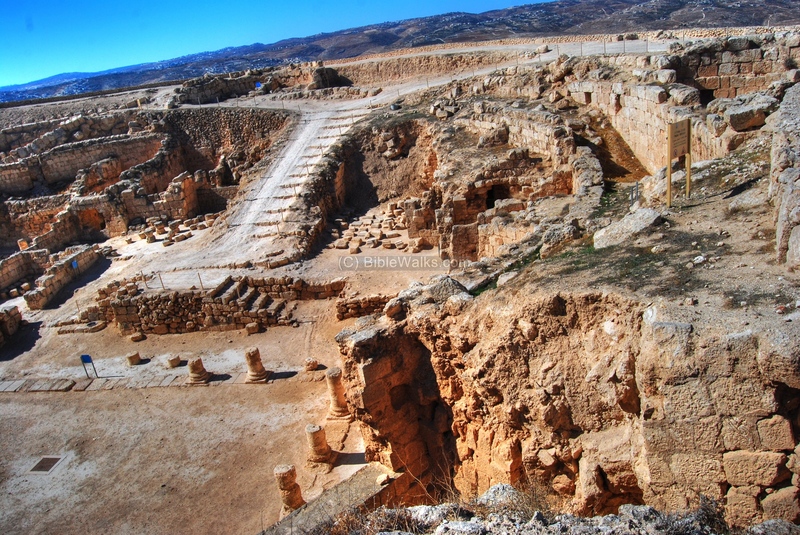 At the bottom, on the north, is a platform with buildings, and a large reservoir, once fed by an aqueduct from Urtas [BW: Artas, near Solomon's pools]. The greater part of the cone is artificially constructed". "The top of the hill is surrounded by a circular wall, 5 feet thick. Inside this is a second of similar thickness, 18 feet from the first. The inner wall has towers pointing (roughly speaking) to the four cardinal points. Those on the north, south, and west were semicircular and 38 feet interior diameter. 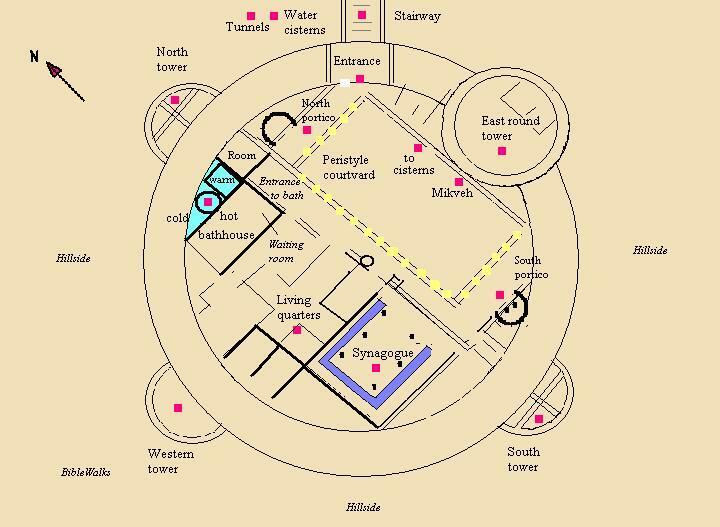 That on the east is larger and higher, being circular, 60 feet exterior diameter, with a wall 6 feet thick. The foundations of these walls and towers are traceable throughout with little difficulty. The interior of the fortress is considerably lower than the walls, and as far as could be ascertained without excavation, there was an interior esplanade 36 feet broad, supported on vaults. 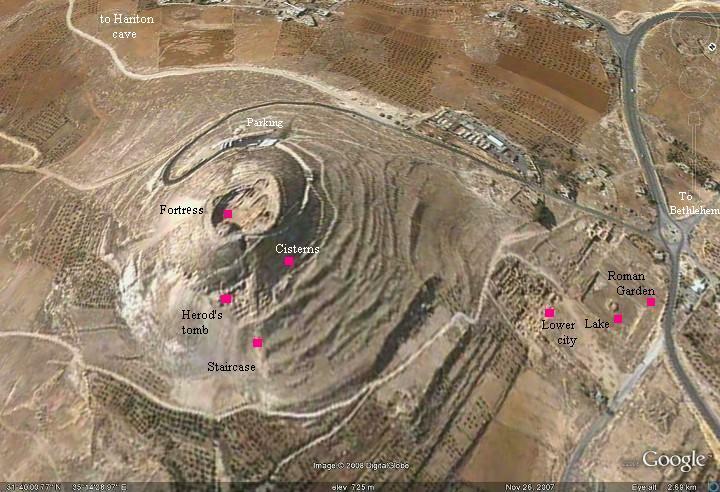 This agrees with the account given by Josephus that Herod increased the height of the hill artificially". "A wall runs down the side of the hill on the east (40° bearing) to the bottom of the steep slope 250 feet below the top. A path also now ascends almost direct from the west. The former is probably the path mentioned by Josephus as having 200 steps. Remains of the steps are still traceable; one was 15 inches tread, 13 inches rise ; another 13 inches tread, 8 inches rise. The breadth of the flight was about 22 feet. On the slope west of the steps are remains of a tower about 24 feet broad. Inside the great tower is a vault 11^ feet by 14 feet, with a semicircular arch of small stones and a tessellated floor. 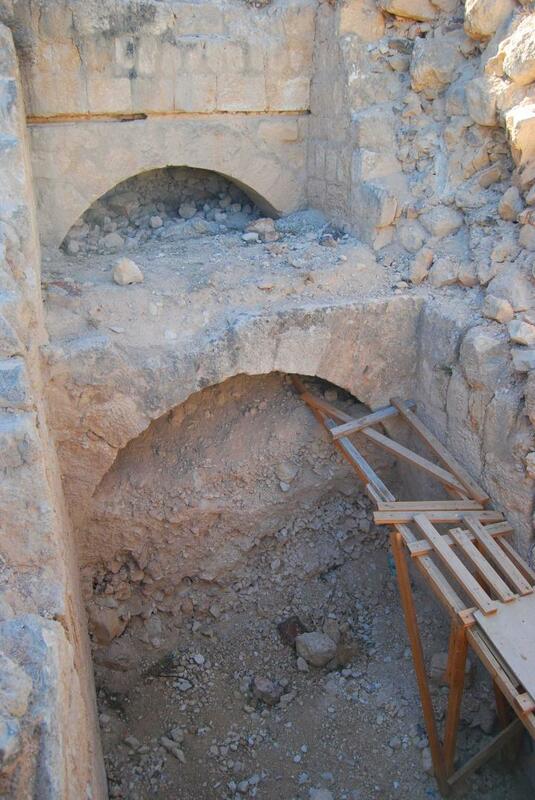 The vaults are nearly all covered up, but one chamber was entered on the north. It was round, with a domed roof 13 feet diameter. There was a central keystone to the dome, and a ring with four stones round it ; the second course had 8 stones, the third 1 1 stones, and so on, eight rings of masonry forming the dome. The work throughout is very well finished ; the stones not of any great size. A door on the west leads into an inner rectangular chamber, 15 feet long, cemented inside. 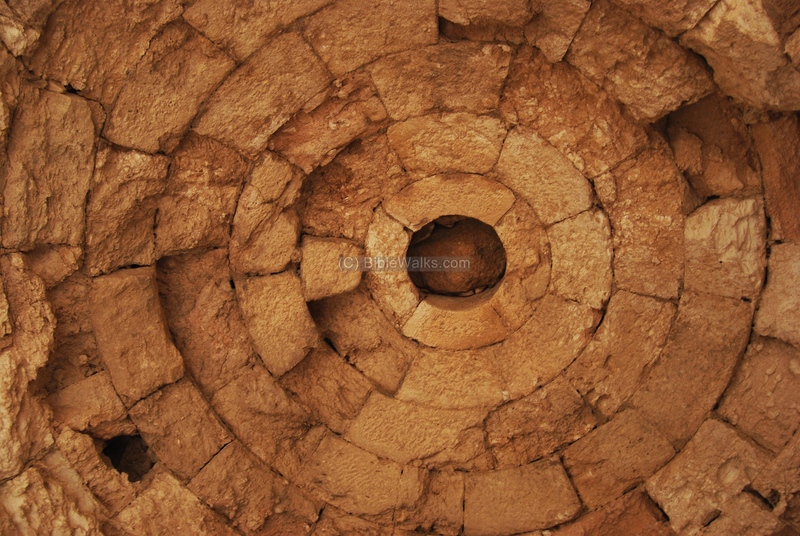 It may be noted that this dome resembles in construction that of the Double Gateway at Jerusalem". "The masonry of the fortress walls is well dressed. One stone had a very shallow draft, 2 1/2 inches broad, but the majority of the stones are dressed with smooth faces ; one stone measured 3 feet 8 inches by 2 feet. The arches are semicircular, of smaller masonry than the walls, and the cement used is very hard. No groined vaults were found, the tunnel vault only being observed. Tesserae large and small were picked up. The building at the foot of the hill is called by the natives Istabl (' Stables ') and seems to answer to the lower palace mentioned by Josephus. It stands on a platform artificially leveled, and presents a series of very long narrow vaults, parallel to one another, with a cross vault at the east end. The west end is partly destroyed ; the longest vault is about 500 feet long, east and west, the breadth being only 8 feet. The total breadth of the building, north and south, is 86 feet. In 1882 the principal vault was found to be closed by a new wooden door. There are remains of a small circular tower towards the east end, close to the cross vault, 18 feet exterior diameter. There are six windows in the cross vault looking out eastwards, 2 feet 9 inches by 5 feet inside, and 1 foot by 2 feet (in height) outside. These form loopholes. The vaults had barrel roofs, some of which still remain, with an even number of voussoirs. There was also an arch with a central keystone. The masonry is throughout of moderate size. North of the building is a kind of terrace 80 feet wide, and beyond this on the north-west is a fine cemented cistern, and ruined houses near it. There are also two other ruined cisterns. North-west of these buildings arc remains of a reservoir called Birket el Hummam, or according to others, Birket Bint es Sultan, standing on a broad platform, at a level 2,082 feet above the sea. It measured 160 feet by 220 feet, and in the middle is a round structure, perhaps originally a fountain, 30 feet diameter. A broad flat platform extends eastwards from the birkeh for 150 yards, and is supported by a wall running north and south. East of this platform, and north of the supposed lower palace, is a great sunk rectangular area, apparently a garden, measuring about 400 feet by 200 feet. There are traces of other ruins on the north side of this plateau, and a vault now closed with a wooden door. Visited 3rd November, 1873; 11th July, 1881 ; 7th April, 1882". Archaeological surveys studied the site in the 18th and 19th century . An early excavation (1962-1966) was held by the Franciscans, headed by Vigelio Corbo, who unearthed the upper city. Professor Ehud Netzer (Univ. Jerusalem) headed the archaeological excavations for 38 years since 1972, initially focusing on the lower city. 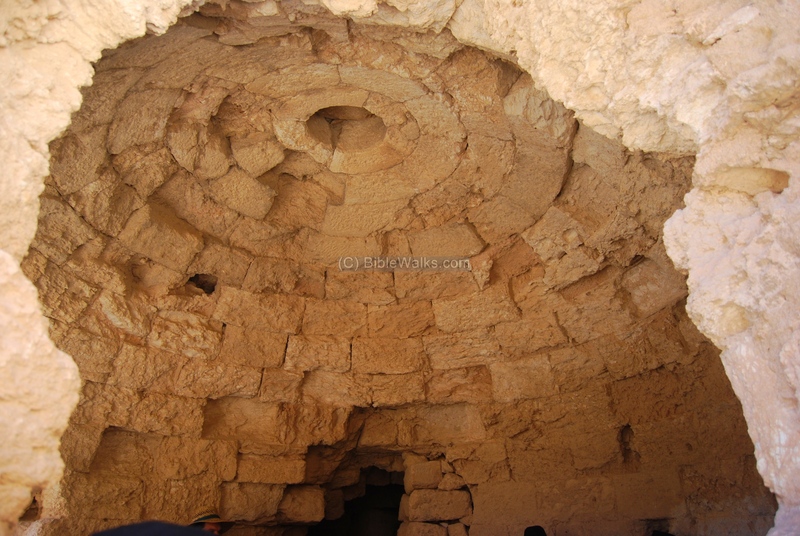 In 1988 he revealed a massive network of tunnels and cisterns on the north-eastern hill side, which were constructed by Herod and added later by the rebels. In 2007 Netzer's announcement of the discovery of the royal tomb of Herod, in a monumental building on the north-eastern foothills of Herodion, made large worldwide headlines (reported in BibleWalks on May 9). Although parts of the tomb were indeed discovered in the monumental building, he continued to look for the other parts of the royal tomb and to find more conclusive evidence of the final resting place of the great King, and the actual location of the burial chamber. 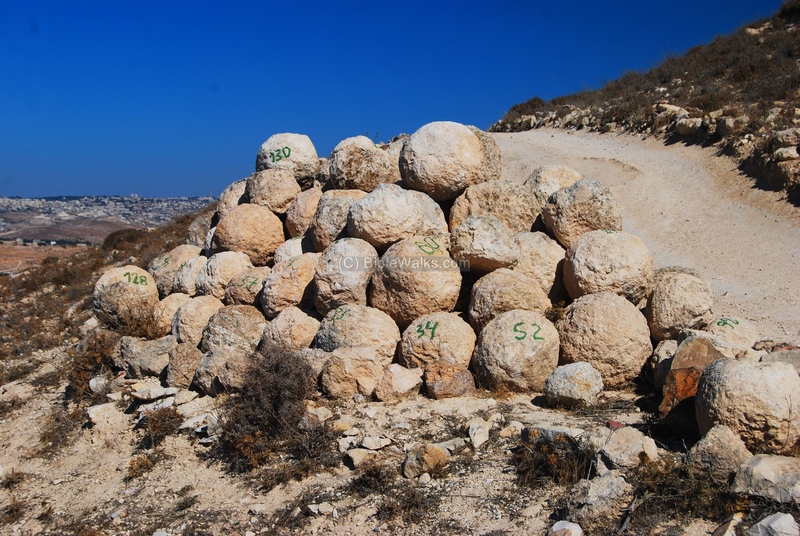 Ehud Netzer died tragically in Oct 2010 on the site of the excavation, while preparing an exhibition of the findings. The exhibition finally opened in 2013, displaying the reconstructed burial chamber, palace halls, as well as portraying the history of the great builder king. Herodion is a national park, and is a recommended site to visit. Due to security reasons, it is advised to join an organized tour. The plan of the fortress is seen in the illustration below. It is built entirely with hewn (smoothed) stones, and has a unique design: the structure is circular, with four round towers on each direction. Three of the towers stick out of the external wall, and are divided into rooms and levels. The double wall is 63 M in diameter, 35M deep, and looks like a crater inside a volcano since the external walls are hidden behind earth fill. The fortress is located on the trimmed-cone hill, and rises 30M (five levels) above the natural stone level. The builders of the fortress used the soil from the lower hill on the north side to cover the fortress with dirt along the side of its walls. The next aerial view was captured vertically above its center, with the north side on top. The following photos focus on the structures inside the top of the hill. Josephus wrote about this (Wars 7 Chapter 6 Par 1): "he built a wall round that top of the hill, and erected towers at the corners, of a hundred and sixty cubits high; in the middle of which place he built a palace, after a magnificent manner, wherein were large and beautiful edifices". A view of the top of the hill is seen below, above the entrance to the fortress. On the left side is the eastern tower; in the center is the large courtyard. In the background is the south tower and walls, while the western tower is seen on the upper right side. A view of the eastern tower is seen below. It is the largest of the four towers: 18M diameter verses 14M . The tower is different from the other three towers - it expands into the inner section, its base is blocked, and it used to stand high above the fortress. Originally, the tower was built 16M above its base, with 5 floors inside. To the left of the round tower is the entrance to the fortress, where the previous picture was taken. A view of the south tower is seen in the photo below, where the group is standing. Below is the south portico ( a roofed entrance that is supported by columns and walls). The walls above it still have a layer of plaster, where once colorful frescoes were painted over it. Josephus wrote about this (Wars 1 Chapter 10 Par21): "...filled up the remaining space with the most costly palaces round about, insomuch that not only the sight of the inner apartments was splendid, but great wealth was laid out on the outward walls, and partitions, and roofs also". Below is the north portico, which is located between the bathhouse on the left and the entrance on the right. Another view of the courtyard, with the large eastern tower in the back. Below is a closer view of the north tower (on the upper right corner) and the west tower (on the upper left side). This photo shows the western tower. 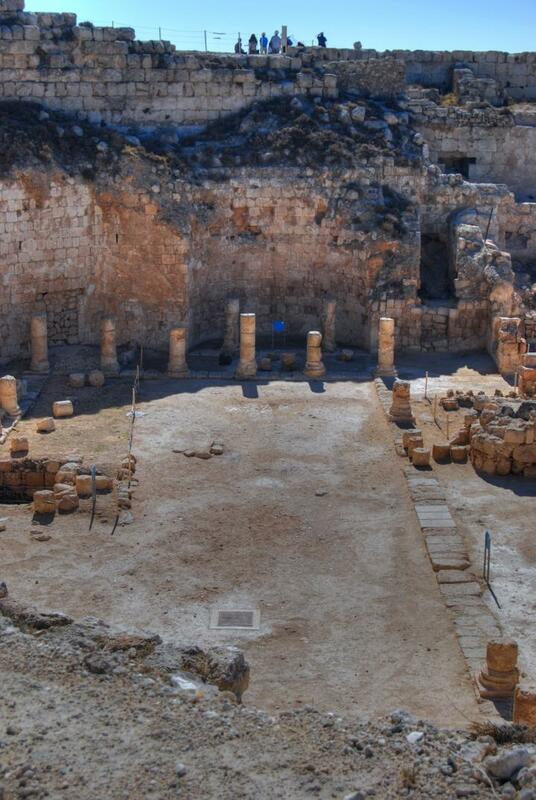 Below the western tower are the living quarters, where Herod resided while staying in this summer palace. 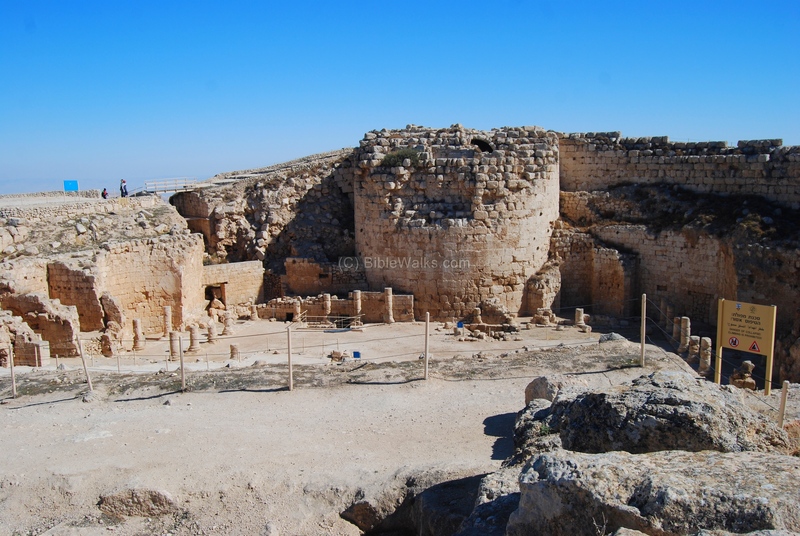 When Herod built the fortress, a public structure was built on the south-western side which was used as a reception hall. 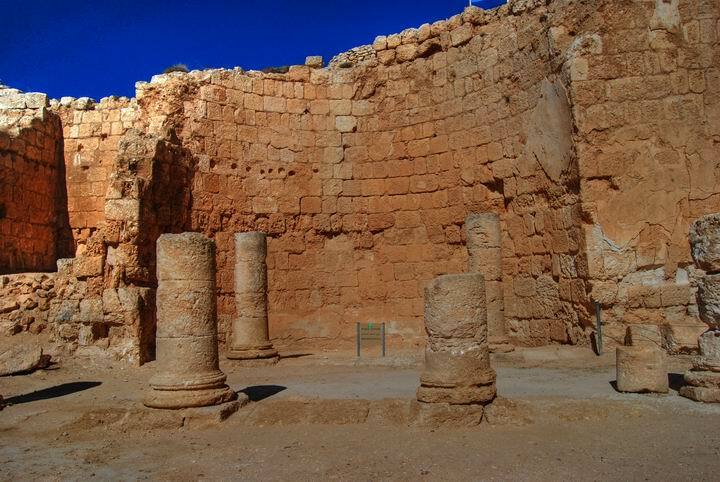 Years later, during the great revolt (66AD-70AD) the structure was converted to a synagogue, which is seen below. It is composed of a wide room, with benches on three sides, and columns that supported the roof. 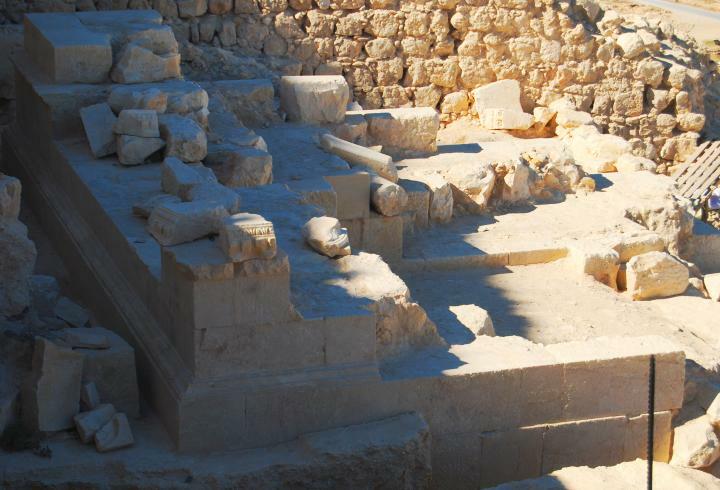 A closer view of the 1st century AD synagogue is seen below. The Zealots also added a ritual Mikveh (baptismal) in the courtyard as part of the preparation for the gathering in the synagogue. Stairs lead to the bottom of a pool. 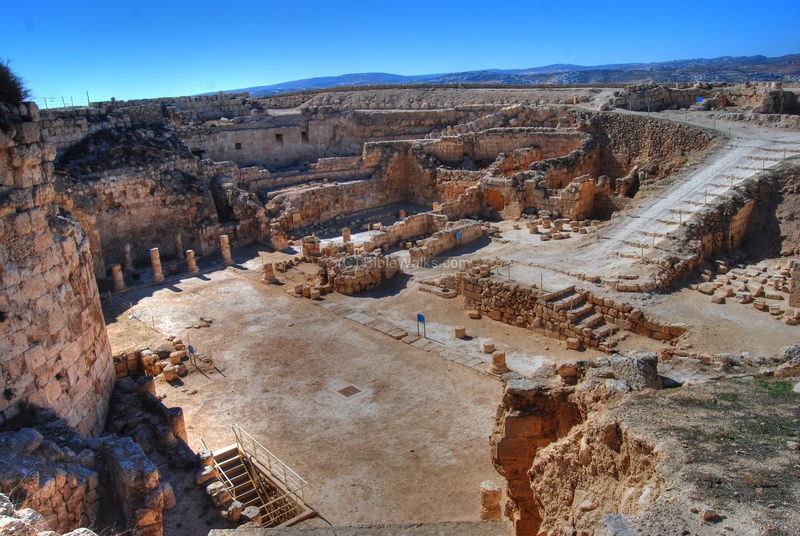 A Roman bathhouse complex is located on the north-west side. It is composed of several rooms - a cold, warm and hot baths, waiting and entrance room. The photo below shows the hot bath area. Another view of the baths is seen below. The smoke went up the chimneys in the center side. Behind, under the cover, was the warm bath. A view of the roofed warm bath. This dome is one of the oldest in Israel. Behind the closed door, seen on the bottom of the photo, was the cold room, and included a small pool. A closer view of the beautiful ceiling. The Herodian entrance to the fortress is located on the north-eastern side. It ascended straight up the hill in a steep set of external stairs, then passed under the walls is an arched corridor. 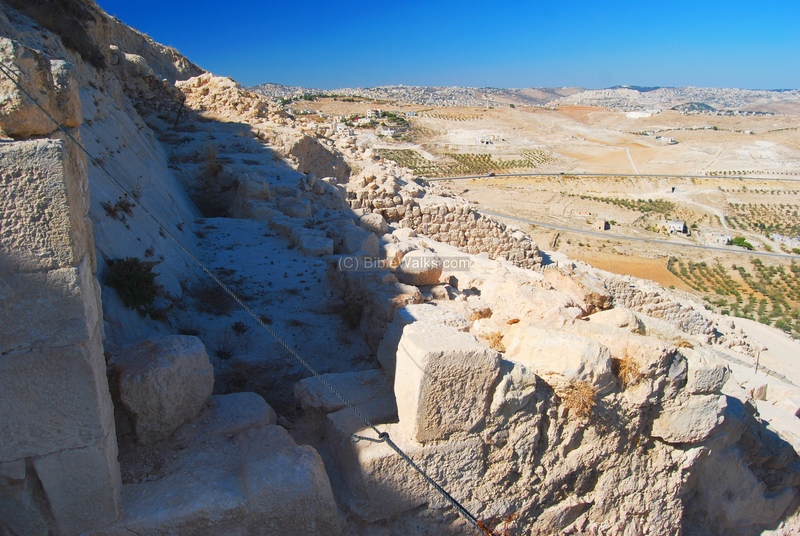 The stairway was made out of 200 marble stones, now all gone, as described by Josephus (Wars 1 21 10): "raised an ascent to it of two hundred steps of the whitest marble, for the hill was itself moderately high". The stairway from the lower city ended behind the openings on the inner wall, as seen from the courtyard in the photo below. The entrance to the fortress is seen here from the external side. The steps passed under the arches , passing through a corridor into the city. 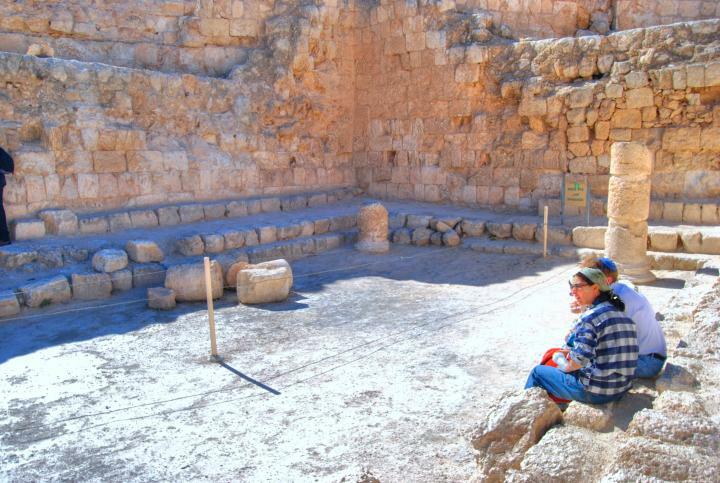 In the courtyard, near the eastern tower, is a stairway that descends to the Herodian 1st century BC cisterns and 2nd century AD tunnels. These are located outside the walls under the north-eastern hillside. 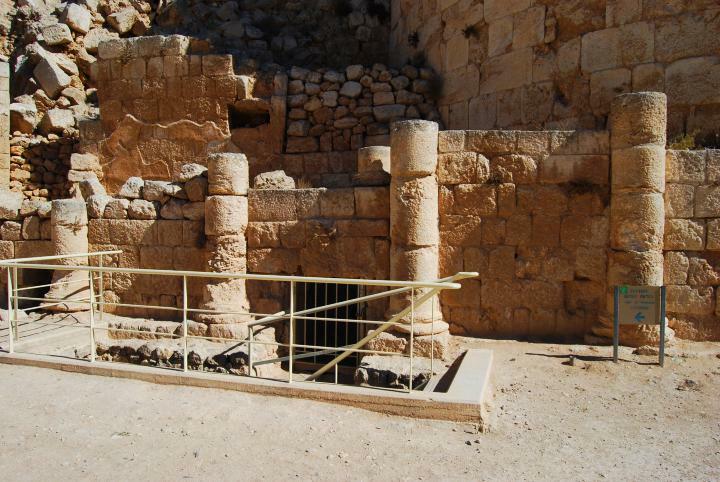 Herod built an underground access to large cisterns that were built on the north-eastern side. As Josephus wrote in Wars 7 Chapter 6 Par. 1): "He also made a great many reservoirs for the reception of water, that there might be plenty of it ready for all uses... ". The photo below shows the large reservoir, which collected rainfall for use during the dry seasons. A roofed exit was built from the large cistern. 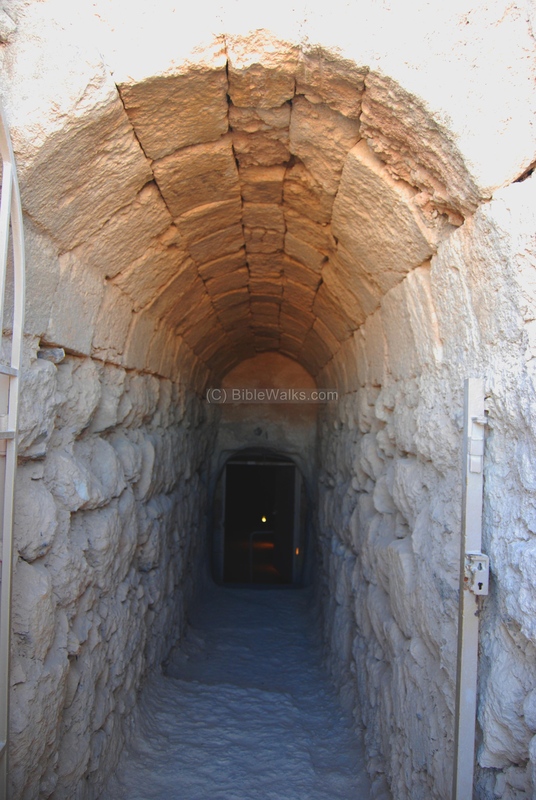 The tunnels were prepared by the rebels of the Bar-Kochva revolt (Bar Kokhba, 132-135AD). 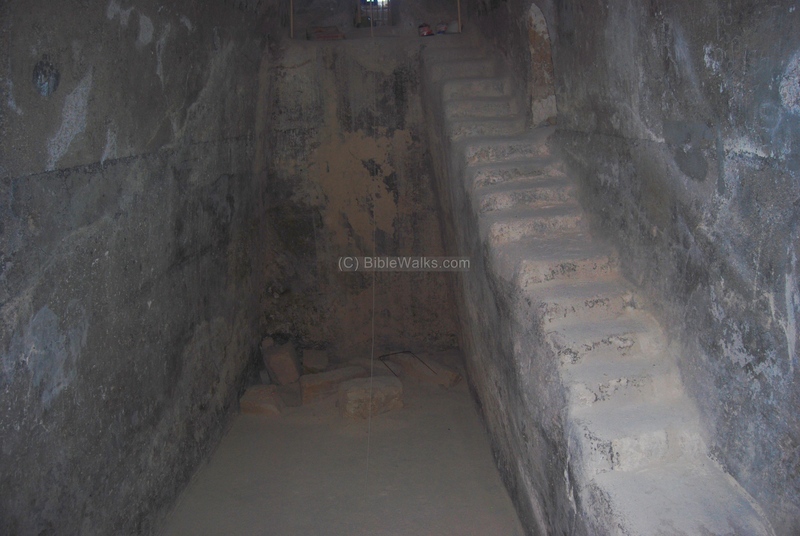 They curved the network of tunnels and stairs in parallel to the water supply system that was built by Herod. These tunnels were used for hiding. Yet another view of the tunnels near the large cistern is seen below. On the western hillside, near the park entrance and parking, is a collection of ballista stones. It is not clear if these stones were arranged by the defenders or by the attacking Romans. Josephus wrote about this (Wars 7 Chapter 6 Par 1): "Moreover, he put a large quantity of darts and other machines of war into it, and contrived to get every thing thither that might any way contribute to its inhabitants' security, under the longest siege possible". The lower city is located on the north-west foothills of the fortress. The lower city structures contained offices of the district capital, palace rooms for the visitors and family, Roman garden, and a lake. It extended beyond the modern road, and include another bathhouse and other structures. The colonnaded area with a lake in the center was a large Roman garden, with trees planted around the area. 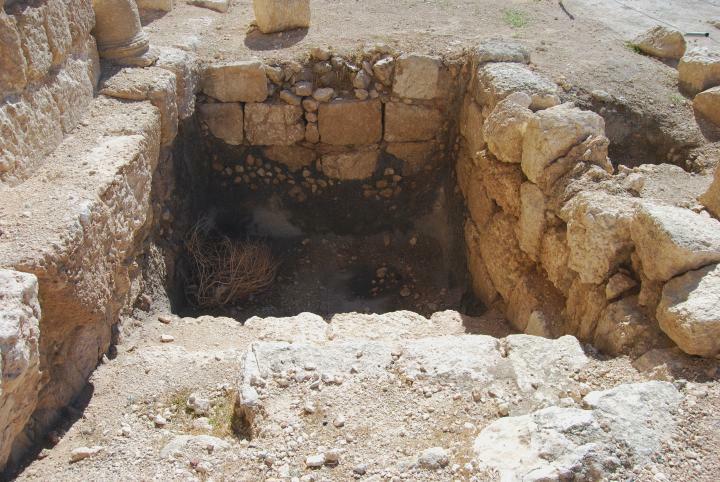 The lake in the center (70M x 40M x 4M) also served as a water reservoir, and received its waters from the Artas springs near Bethlehem by an aqueduct. Josephus wrote about this (Wars 1 Chapter 10 Par 21) : "Besides this, he brought a mighty quantity of water from a great distance...". In the center of the lake was a colonnaded structure. The structure south of the lake is seen below. It is a monumental structure (130M x 55M) contained the lower palace and offices. 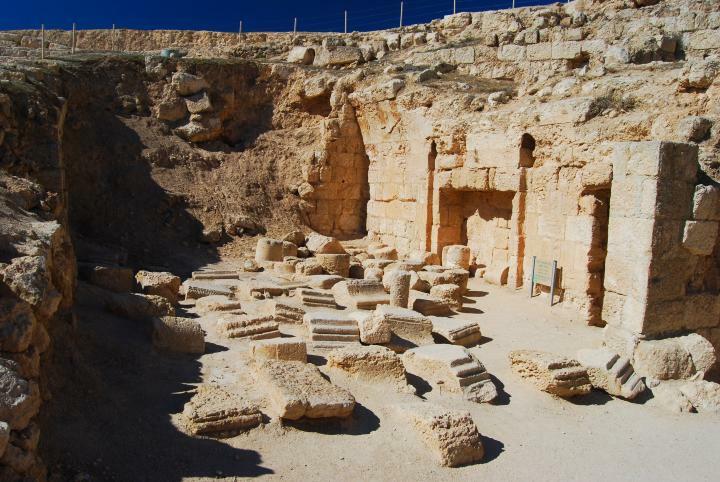 The search for Herod's tomb was one of the greatest archaeological quests. A worthy place - the top of the hill - was excluded from the probable locations, since the King avoided a controversial burial inside the fortress which will make it impure. The first attempts were focused on the lower city, based on Josephus's description of the royal funeral (Wars 1 Chapter 33 Par 9). After futile efforts, the attention was shifted to the hillside. On the north-eastern side of the fortress is the stairway that connects the lower city to the main entrance of the fortress. The archaeologists, headed by Professor Ehud Netzer (Univ. 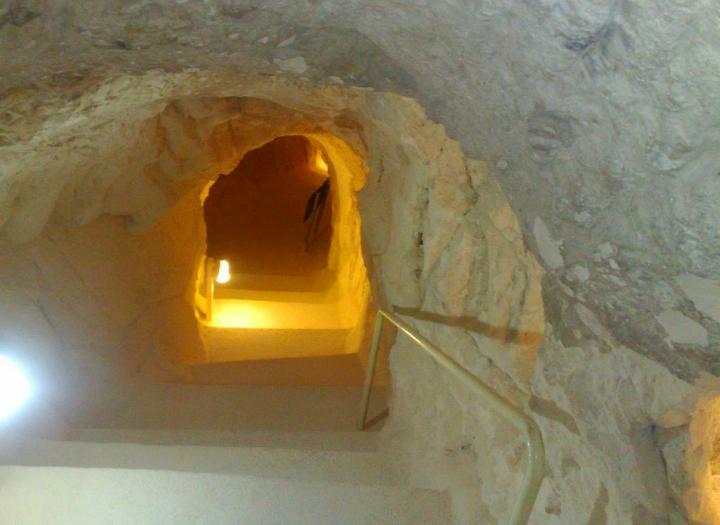 Jerusalem), searched for Herod's tomb along this stairway, which is seen in the background of the photo below. In the 2008 season a section on the west side of the stairway was excavated. 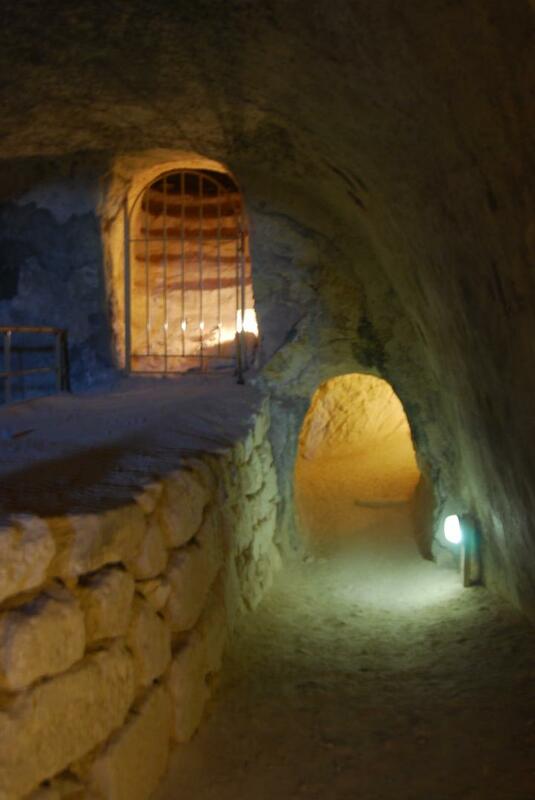 Perhaps it is the actual burial chamber of King Herod?.. This was documented in a film that was prepared by National Geography (released on Nov 25). Ehud Netzer and his team continued to reconstruct the royal burial chamber. They found that Herod first demolished and covered the original structures of his fortress - theater, villas and store rooms - that once were built on this side of the mountain. He then replaced them by a monumental royal box where his tomb was constructed. The burial chamber was later smashed during the great revolt against the Romans, and the team had to assemble the pieces in order to reconstruct it. 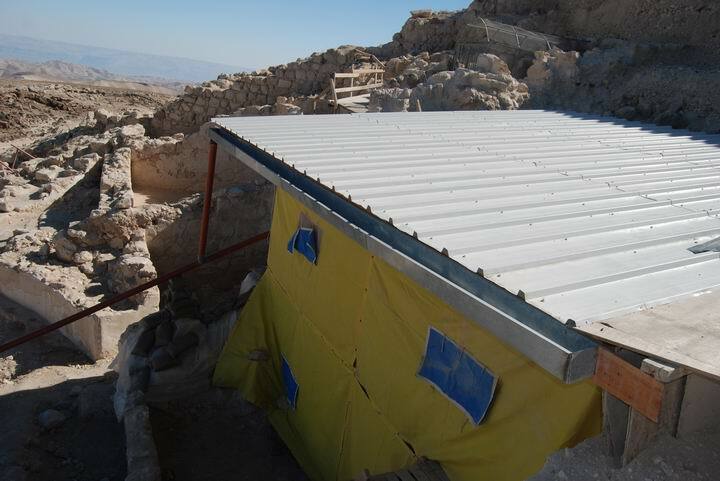 Tragically, Ehud died in Oct 2010 on the site of the excavation while preparing an exhibition of the findings. The reconstructed burial chamber was later exhibited in the Israeli Museum in 2013 (view the gallery tour in the links section). You can view panorama views from the top of the hill towards three directions. This uses a flash-based panoramic viewer, where you can move around and zoom in and out. Note that it may take minutes to upload them. Josephus Flavius was a commander of the Galilee Israeli army during the revolt against the Romans. He surrendered to the Romans and became an important historian of the period. His accounts of Herod provide the most comprehensive information on his actions, including on Herodion (Herodium). Although Josephus wrote his books more than 70 years after Herod's death, his accounts are based on Herod's personal scribe and historian - Nicholus of Damascus - and therefore are considered reliable. "And as he transmitted to eternity his family and friends, so did he not neglect a memorial for himself, but built a fortress upon a mountain towards Arabia, and named it from himself, Herodium and he called that hill that was of the shape of a woman's breast, and was sixty furlongs distant from Jerusalem, by the same name. He also bestowed much curious art upon it, with great ambition, and built round towers all about the top of it, and filled up the remaining space with the most costly palaces round about, insomuch that not only the sight of the inner apartments was splendid, but great wealth was laid out on the outward walls, and partitions, and roofs also. Besides this, he brought a mighty quantity of water from a great distance, and at vast charges, and raised an ascent to it of two hundred steps of the whitest marble, for the hill was itself moderately high, and entirely factitious. He also built other palaces about the roots of the hill, sufficient to receive the furniture that was put into them, with his friends also, insomuch that, on account of its containing all necessaries, the fortress might seem to be a city, but, by the bounds it had, a palace only". 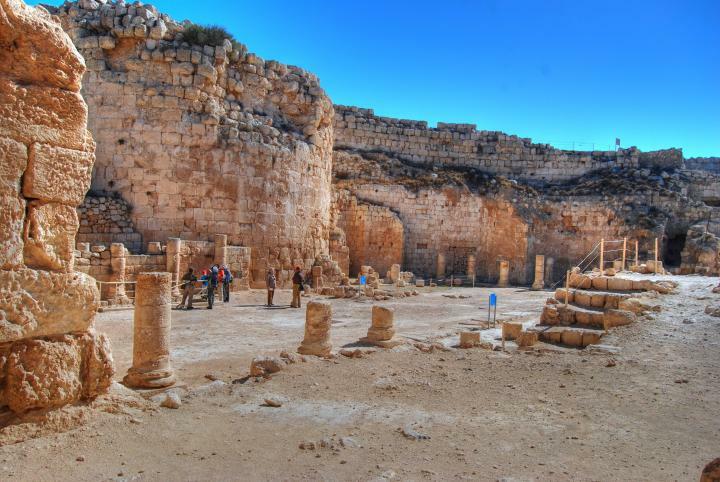 Herodion was built in the site of Herod's important battle, held in 40BC when he retreated thru the Judean desert to Edom. Herod and his family were on pursuit by the Parthians (from Persia) and their Hasmonean alley, Matthew Antigonus. The battle was held in Tekoa near Herodion. This victory was a turning point for Herod: the Romans appreciated his skills and loyalty, in addition to his father's assistance for Julius Caesar during the Alexandria siege (47BC). Octavian (Augustus) received him in Rome with great honor after the Parthians retreated back to Persia in that year (40BC). Mark Anthony made the Senate appoint him as "king of the Jews". "Now in the place where Herod beat them, and killed a great number of them, there he afterward built a citadel, in memory of the great actions he did there, and adorned it with the most costly palaces, and erected very strong fortifications, and called it, from his own name, Herodium". "After this, they betook themselves to prepare for the king's funeral; and Archelaus omitted nothing of magnificence therein, but brought out all the royal ornaments to augment the pomp of the deceased. There was a bier all of gold, embroidered with precious stones, and a purple bed of various contexture, with the dead body upon it, covered with purple; and a diadem was put upon his head, and a crown of gold above it, and a secptre in his right hand; and near to the bier were Herod's sons, and a multitude of his kindred; next to which came his guards, and the regiment of Thracians, the Germans. also and Gauls, all accounted as if they were going to war; but the rest of the army went foremost, armed, and following their captains and officers in a regular manner; after whom five hundred of his domestic servants and freed-men followed, with sweet spices in their hands: and the body was carried two hundred furlongs, to Herodium, where he had given order to be buried. And this shall suffice for the conclusion of the life of Herod". "Now Lucilius Bassus was sent as legate into Judea, and there he received the army from Cerealis Vitellianus, and took that citadel which was in Herodium, together with the garrison that was in it; after which he got together all the soldiery that was there, (which was a large body, but dispersed into several parties,) with the tenth legion, and resolved to make war upon Macherus;". Herod - the name may have been derived from Greek "Heros"
Herod the "Great" - the suffix is added in order to differentiate him from his sons, which were also named Herod. Jabal al-Fourdis , Jabal Fureidis- Arabic name of the site ( "Mt Paradise"), probably derived from "Herodis"
"Mount of the Franks" - a common name by Christians; named after the Frank Crusaders that fled to it after the fall of Jerusalem at the end of the 12th C.
National Geography - "Lost for centuries, Herod's tomb comes to life"